Stevie Trachsel won his seventh straight start, as the Mets beat the Cubbies 6-3 in the first game after the All Star Break. 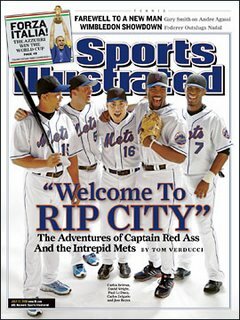 Nice to see the Mets offense clicking on all cylinders after a four day layoff. Jose Reyes still hasn't completely recovered from his pinky laceration, but Jose Valentin filled in nicely in the leadoff spot. 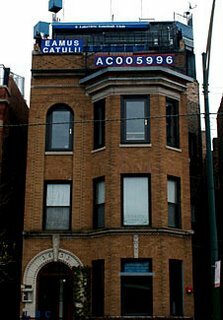 Besides the win, the best part of the game was Gary Cohen explaining what those numbers on the building across from Wrigley Field stand for. The Lakeview Baseball Club, which sits across Sheffield Avenue (right-field) from the stadium proudly displays a "calendar" demonstrating the Cubs' futility. The calendar is flanked by a sign that reads Eamus Catuli! which means "Go Cubs!" in Latin (catuli means "whelps" in Latin, the closest Latin translation to the word "Cubs"), and the calendar is labeled "AC," for "Anno Catuli," or "In the Year of the Cubs." The first two digits display the number of years since the Cubs' last division championship as of the end of the previous season (02; their last division championship was in 2003), the next two digits display the number of years since the Cubs' last trip to the World Series (60; their last Series was in 1945), and the last two digits display the number of years since their last World Series win (97; their last win was in 1908). It is not currently known what the LBC will do with the "calendar" if the Cubs reach 100 years without a World Series title. How Has Billy Wagner Done Compared To Braden Looper? Pre All Star Break 2004 (Braden Looper): 2-1, 1.88 ERA, converted 18 out of 20 save opportunites (2 Bln Svs). Opposing batters hit .247 42 K's in 46 innings. Pre All Star Break 2005 (Braden Looper): 2-4, 3.41 ERA, converted 20 out of 24 save opportunities (4 Bln Svs). Opposing batters hit .268. 15 K's in 34 innings. Pre All Star Break 2006 (Billy Wagner): 3-1, 2.43 ERA, converted 18 out of 22 save opportunites (4 Bln svs). Opposing batters hit .190. 52 K's in 40 innings. By the way, at the All Star Break this season, Braden Looper is 4-1 with a 3.96 ERA. He recorded 23 K's in 40 innings and opposing batters hit .274. He also failed to convert his lone save opportunity this season. According to ESPN, the Yankees have signed right hander Sidney Ponson to fill out their rotation. Ponson is 4-4 with a 5.24 ERA in 14 appearances with St. Louis this season, and was released by the Cardinals on Wednesday. Last September, the Baltimore Orioles released him due to his alcohol problems. He was convicted of driving while impaired and sentenced to five days in jail and he also spent 11 days in jail after fighting on a beach in Aruba. There is no game this afternoon. The Mets don't pay until tomorrow. A Four Day All Star Break? What the hell? Who are these schedule makers anyway? Everyone knows that it's three days off before games begin. These schedule makers must be a bunch of Commies and America hating bastards. REAL baseball starts again this afternoon, as the Mets take on the Cubbies at Wrigley Field. I have made it to quite a few Major league Baseball parks over the past few years, and although some of teh new parks knock my socks off, nothing compares to Wrigley. If you consider yourself a baseball fan, you need to make a pilgrimage to this Baseball Heaven. Even though I'm a Mets fan if I were gonna scatter my ashes somehwere it would be Wrigley. It's just pure baseball. Hopefully the Mets will enjoy playing there this weekend as much as I enjoy visiting, and will sweep those friggin Cubs out of their own ballpark. By the way, if anyone thinks I'm some kind of closet Cubs lover, I do need to say some things about that franchise. They have the dumbest fans in all of sports. Decades of inept ownership and bad management have led to their World Series drought, not a curse. At least the Red Sox had Babe ruth to blame their woes on. Cubs fans blame a damned goat and some geeky fan. Give me a break! The Cubs are woeful due to their own doing. Just as the most recent example, if they hadn't overused the arms of Wood and Prior when they first came up the Cubbies would probably have won the last two World Series. But no. Oh, yeah, the All Star Break is over and I am ready to go! To hell with cursed magazine covers and cursed watches and black cats and whatever. David Wright shined in teh all star game and made more little girls fall in love with him with his Letterman appearance. Now it's time to get back on the field. It's time to turn it on and step on some necks! By the way, today is my birthday. I turned 31 today, and Mrs. TransplantedMetsFan gave me a great Transplanted Mets Fan gift. I got a portable XM radio reciever. Now I can take Mets broadcasts wherever I go! I did not watch even one minute of last night's game, even though Beltran, Wright, and LoDuca were in teh game. Apparently Wright and Beltran played well, which I am happy about, but to me, if Tom Glavine didn't care enough about the outcome to make sure he could pitch in it, then why should I care? After all, MLB tells us we shoudl care about the outcome because the winning league gets home field advantage in the World Series. And shouldn't Glavine be hoping to pitch in that World Series? Yes, I believe in this stuff. Ugh! I missed a lot of Mets during my trip to the beach. I missed Reyes injury, David Wright's latest game-winning homerun, and the debut of Mike Pelfrey. Luckily I also missed Lima's dreadful outing and the loss to the Marlins in game one of Saturday's doubleheader. But I'm back, and even though there are three Mets playing in the thing, and if the National Legaue wins it will be better for the NL pennant winner (hopefully the Mets), I have no intention of watching tonight's All Star Game. I really want to care, but I don't. Maybe I'll have a change of heart tonight at 8, but I doubt it.